Description: Keister's Tire & Battery is a business categorized under tire-dealers-retail, which is part of the larger category auto & home supply stores. Keister's Tire & Battery is located at the address 308 E 2nd St in Kewanee, Illinois 61443-2314. The Manager is Mark Reynolds who can be contacted at (309)853-4469. 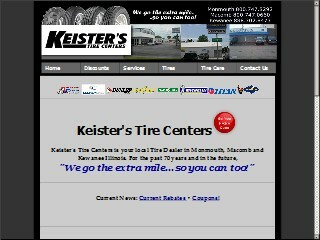 Location & access map for "Keister's Tire & Battery"